Today is intended to be our third day trip from York in as many days. The previous two saw us complete a wonderful seven-mile coastline hike along the North Sea cliffs from Robin Hood’s Bay to the beautiful seaside abbey town of Whitby. And yesterday we took the train out to Durham to pay a visit to the Cathedral and wander about the hilly and ancient cobbled streets of the city. We are now attempting to complete a trek suggested to us by a gregarious mountain of a bloke we met a few evenings ago. He had the requisite beer belly and scraggly beard found on any respectable long distance hiker. His booming voice eagerly outlined a day out that involved a nine-mile hike along the coast line that included crossing the three-mile-long Humber Bridge before turning to public transport again to continue on to the historic port town of Hull. To alleviate any confusion in translation or comprehension, the key details were crudely scrawled upon a bar napkin in what I think may be a local Yorkshire form of “Olde” English. The alarm went off at 6:30 AM. This was by far our most ambitious endeavor. After enjoying a time restraint free existence (apart from the draconian and seemingly non-sensical opening times of restaurants and pubs. You just try and get a lunch meal after 2PM) it was time to ramp up for our backpacking ventures. The train was scheduled to leave at 7:30. That gave us roughly 40 minutes to wash up, get our day packs loaded with water and a breakfast to eat on the train. All started well. Out the door in a relative flash. This included my standard bits of dawdling and mucking about the apartment searching for this, that and the other thing. Not sure why I do this. Perhaps it is genetic? I imagine a long lost ancestor turning over his cabin aboard the Titanic in search of his A to Z pocket guide to the Atlantic Ocean and half eaten roll of breath mints when he learns of the breach in the ship’s hull. If it is in fact genetic, thankfully it hasn’t yet proven to be a Darwinian flaw. It is a trait that my most patient wife surely holds dear. A search for some items to put in the post provided the quandary for the morning. However, we breezed thru the sleepy streets of the old town and reached the railway station seven minutes before departure. Ever the Project Manager, I suggested we split up. One of us gets the tickets, while the other grabs some coffee for us to enjoy on the train. I expected to take the ticket run as I had successfully navigated the complexities of the wonky ticket machines just yesterday. However, Emma volunteered and I gladly accepted coffee duty. Upon inspection the Starbucks was out of filtered coffee. I scolded myself for even considering giving them my custom. I proceeded to the main departures board and observed that our train is going to be 10 minutes late. What a stroke of luck! 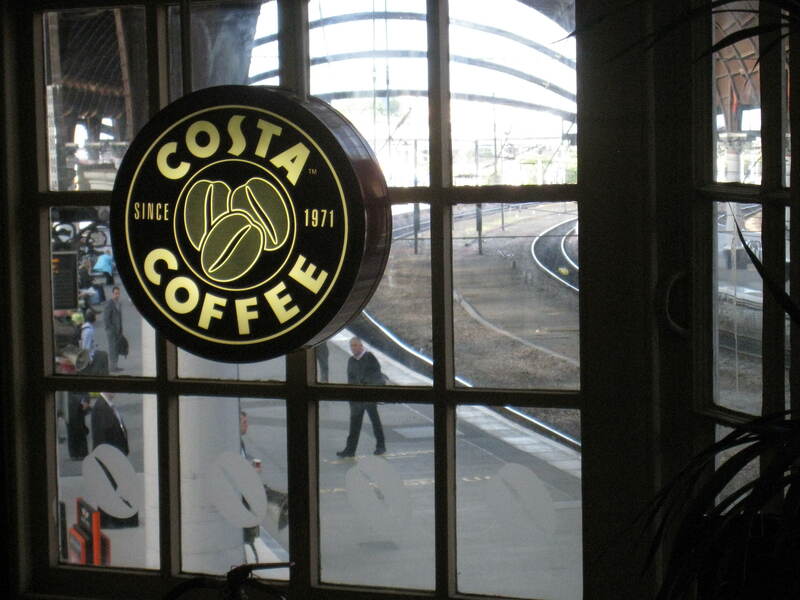 I can go to the Costa stand above the platform and get Emma a cup of her favorite chain coffee. I might even have enough time to help Emma purchase the tickets. Hell the way things are going I may have time to fetch a paper and peruse the huge selection of magazines whose covers contain scantily clad celebrities I have never heard of. No time to daydream. With a spring in my step I set off for Costa. I arrived to find that the line was substantial with one bloke both taking orders and creating the caffeine cocktails. No worries. It shouldn’t be a problem. Do you see a train? Despite Emma’s repeated visits to question my decision to remain in the line and protest that we would surely miss our train, I was determined to see it through. There were now only a few gents ahead of me and I could clearly see the track from my vantage point. No train was in sight. We would be just fine. At long last, only one more person ahead of me. I was startled out of the mindless trance that only an early morning coffee queue can induce. The gentleman in front of me ceded his spot and implored me to order first. The middle aged chap with the slightly worn pinstripe suit and bright yet sad eyes must have overheard my wife on one of her “encouraging” visits. Clearly he took more heed to her words than I and was in agreement that I should quit the line and move to the platform at once. Or perhaps he was simply a victim of friendly fire? Did one of the steely ocular daggers miss its intended target and strike him a glancing blow? Maybe he suffered a similar fate years ago and now travels the country a broken man looking for solace from a shattered marriage in the teary bottom of a railway station coffee? Now was clearly not the time to ponder the possibilities. I simply marveled at my good fortune and got in my order. Ringing my hands with delight, I watched the barista work his magic. Moments later I was presented with the long awaited prize. Just as I received my change and reached for the coveted lattes, Emma reappeared for the seventeenth and final time to notify me that our train has just left. Once the shock subsided, I hung my head in shame. I didn’t have the courage to look at pinstripe as I walked out. Apparently, I was not looking at the correct track for signs of our train. It had left on time due to some strange miracle. What was my wife doing during her repeated trips from the coffee line? I assumed she would have ferreted out the correct departure track and reported back should there be any sign of the train. A flash of the icy steel convinced me that perhaps now was not the time to ask. The next train leaves in a little over an hour. Our timetable for the day is now in shambles. The multiple well- timed connections via foot, rail and bus are out the window. There isn’t much to do now but dig into a breakfast of cold Scotch eggs and even colder shoulder. Will I be able to put the day back together? Only time will tell. Will the day rise like a phoenix from the ashes? Or will I, too, be cursed to the walk lonely train platforms in search of the coffee that can warm the broken heart? Lucky for me I don’t even own a pinstripe suit. Sounds just like you, Steve….hopefully you were able to piece your day back together. Enjoy–we are all thinking of you guys. Steve you crack me up! I am assuming since we have received additional blogs that you have managed to regain your composure. Be assured that this will not be the last time that this happens 🙂 We love reading the blogs, keep them coming.